Almost every musician knows they can make some money off playing a gig or selling CDs, but not every musician knows the difference between each revenue stream, nor that they can make money in so many other ways. When you’ve finished (written, produced, or composed) a song and start to distribute your music, you're due royalties from the use of your composition -- more specifically performance and mechanical royalties. It’s important to know the different royalties you can collect - whether its from streams on Spotify or serenading your local coffee shop - and how to collect them since publishing royalties make up a significant part of your revenue as a creator or music business. Mechanical royalties are "newer", a lesser-known form of music publishing revenue - and something almost every person interacts with on a day-to-day basis. You earn mechanical royalties anytime your songs are reproduced, retransmitted, or rebroadcasted. Essentially, anytime your music is recreated, whether it’s through CDs/vinyls/cassettes (you know, those things we all used to run to the store to buy! ), your video is clicked and viewed, or streamed on digital streaming services like Spotify, Apple Music, or Pandora, you earn mechanical royalties. Then a mechanical collection society such as the Harry Fox Agency (HFA) collects and distributes the royalties collected on your songs. The relationship with HFA can be complicated and typically allows more established publishers to collect their royalties, making it difficult for individual songwriters to earn this revenue stream on their own and is the reason that many artists are unaware they deserve to earn them. The good news - Songtrust can collect on your behalf and pay those earned royalties out to you, saving you money, time, and the hassle of hiring your own in-house administrative team. Streaming - such as Spotify, Apple Music, etc, where the user is allowed to choose the songs they listen to, also known as interactive streaming. The subscription fee is the performance royalty (or the non-interactive feature like Pandora radio), but each time someone chooses to listen to your song, you earn mechanicals. Sales - music retailers such as iTunes, Rhapsody, etc are required to pay mechanical licensing societies roughly 9% of revenue earned from every download. In the US, these royalties are paid either directly to publishers, or via the Harry Fox Agency. Outside of the US, these royalties go through the designated mechanical collection society in the territory. These are royalties that often just sit there until a songwriter has their publisher collect them. The type of revenue you get from performance royalties is in the name - and then some. Performance royalties are generated from any public performance like music playing in bars or restaurants, playing a live gig, or when your music is broadcasted on radio or tv. These royalties are collected and paid out by a writer’s PRO (performance rights organization). 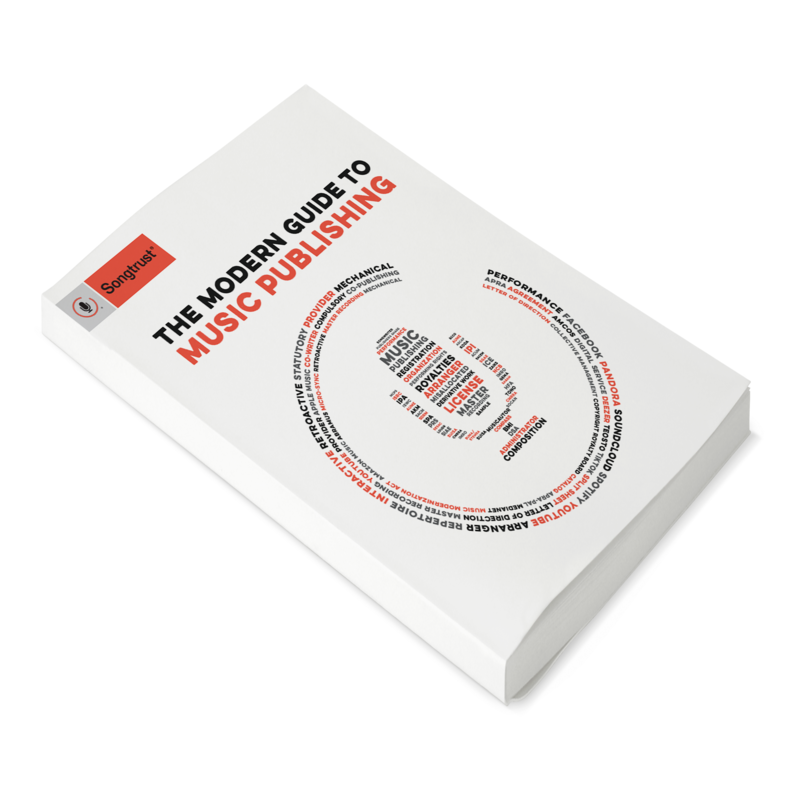 PROs license the songs in their catalog for use and use performance data to allocate the money to publishers and writers. Royalties are based on each songwriter’s ownership share of the song. For example, if you play in a guitar-and-drums garage rock duo, and both members contributed equally to the song, the ownership would be determined between the two writers, sometimes 50/50%. The royalty is also split and distributed equally between the songwriter(s) and the publisher(s), with each being allocated 50% of the performance royalty pie. Depending on what type of deal you have with your publisher (administration, co-publishing, income participation) you may actually only see a portion of those performance royalties. Songwriters that handle their publishing rights through Songtrust maintain 100% of their ownership and can be registered with their PROs seamlessly. Don’t forget that you can also get paid for your live performances. Songtrust is the only platform that allows you to upload past and future setlists to collect your performance royalties. While performance and mechanical royalties make up the majority of revenue streams songwriters and musicians can collect, there are other types of royalties that are often missed. These might not apply to everyone, but it’s good to know where your music can make money off of - whether it's for your own marketing purposes or to just make sure you haven’t missed any royalties. Sync royalties include when your music is licensed to TV shows, commercials for both TV and film, video games, and smartphone apps. Print royalties include lyrical reprints, guitar tabs, and even music sheet books. Yes, you read that right -- when your lyrics are used, you earn money! There are so many ways to collect royalties nowadays, that it’s almost criminal for songwriters and musicians to not stay on top of what they could be earning. Even so, the music industry can be overwhelming and confusing to new writers (sometimes even to seasoned professionals!) and having a good system to check your revenue streams is vital. Keep track of where your songs are being used at, make sure you’re affiliated with your local PRO (performance rights organization), and have a publisher to collect your mechanical royalties. When you sign up with Songtrust, you get the ease and accessibility to know where you’re collecting royalties from, as well as a dedicated team to walk you through all the aspects of music business. Whether it’s collecting performance royalties off your latest gig, or working with HFA and mechanical collection societies around the world to collect your royalties from Spotify or Youtube, our team is here to support all music professionals who own and control the rights to compositions - from new writers to indie labels to established musicians. Want to collect your mechanical and performance royalties? Click below, we don't bite.